In the price is included the provision of kayack to join the famous islet Pinel, the little key ilet and explore sac of the bay. A stand up paddle is also available for free as well as a Jacuzzi on the beach that you can use at will. The property is within walking distance of several local restaurants. You can also enjoy specialties, Creole and French in the restaurants of the nearby island of Pinel, renowned for its fresh lobster. Situated on a private beach in the bay of Cul -de- Bag, qui est share of the national nature reserve. Pinel Belgium Bosnia Studio 3 spacious air-conditioned studios That can Accommodate up to 4 persons. As extra amenities, we offer to our customers the possibility to use the standup paddle and kayaks are great qui Ways to explore the bay of dead end goal aussi the tiny islands of Pinel and little key. Pinel Islandis one of the MOST stops area on the island, in a qui you enjoy fresh lobster at one of the beach bars. 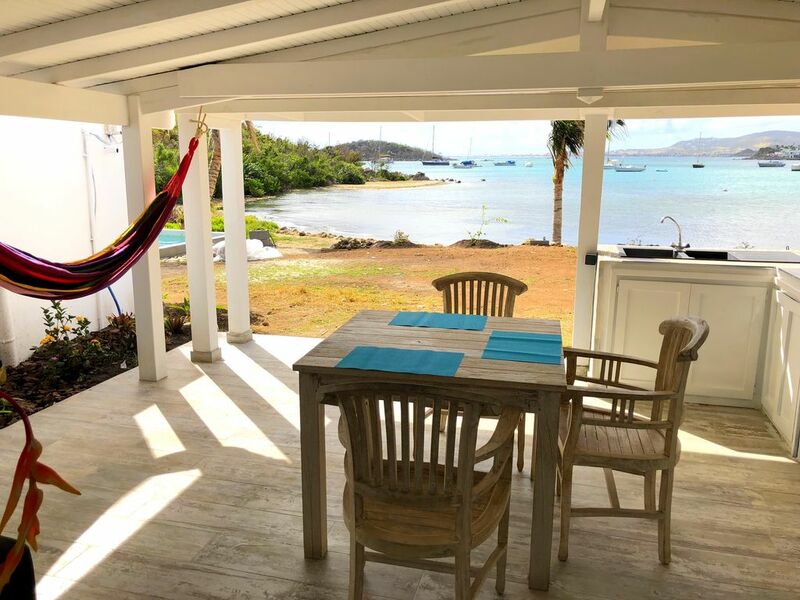 Other highlight of Pinel Studio Will Be icts proximity to one of Most Popular beaches on the island Orient Beach qui est Known for great water sports, great restaurants and great swimming in the turquoise water. Aim the great and unique feature of this property is ending your day enjoying the wonderful Jacuzzi That seats on the beachfront. Pinel studio est Located just 10 minutes' drive away from Grand Case, qui is the dining capital of the Craibbean That goal notes Within a short walking distance you can find several local restaurants are qui Known for Their French and Creole cuisine. So stay with us and Pinel Studio and offer the best of what the Entire Island Has To offer Within steps away. We had a great stay at Bruno’s studio. He was exceptional helpful and very responsive. He was happy to help with anything we needed. The studio had 1 king bed and 2 twins. A nice walk-in shower and a wonderful outdoor kitchen and eating area. The mattress was firm and very comfortable. A small pool is right outside the unit, between the unit and the beach. Be aware, it is not your personal pool. It is shared by Bruno’s other tenants. The beach is pleasant with a few palm trees. There are sea kayaks to use and we took a double over to Pinel Island for a wonderful day. Note that the bay is not swimmable here. It is super shallow and has a mucky bottom. So plan to cool off in the pool. We had a pleasant stay. We love this place! Already booking for next yera! We have stayed at Studio Pinel 4 times and we are booking #5 right now. The Studio has a perfect location. You can Kayak to Pinel Island, take a walk on a private beach just minutes from the studio and reach other great beaches by a short car ride. The Studios are clean, comfortable and I always feel very safe. If you need anything Bruno is happy to help. We really like the patio. You can easily spend your entire day just sitting on the patio enjoying a book or just watching what is happening on the water. You can walk to Villa Pizza or Poncho Villas for an amazing dinner. The local grocery also carries a large selection of items if you want to eat at the room. We always enjoyed having breakfast on the patio watching the day get started overlooking the water. We really enjoyed being able to Kayak to Pinel Island. Karibuni Beach Restaurant and Bar is a wonderful place to spend the day. They have nice chairs sitting next to the beautiful blue water. The service is excellent and I cannot say enough about the food - Yummy! We also like going to Orient Beach, Friars Bay and Grand Case. I need to mention again that Bruno and his wife have always been very attentive to anything we have needed and make booking the Studio very easy. We stayed one week at Studio Pinel early this year. Bruno has been very efficient during the whole process, things went smoothly and he was very helpful the whole stay. We found the location convenient and quiet. Grocery store and pharmacy are nearby. The room is clean with AC and beds are good. We love the exterior kitchen and the kids had a blast with kayaks, the pedal board and the spa. We really hope we can stay there again soon. We stayed at Studio Pinel for 1 week. Before arrival everything was very good arranged with Bruno by e-mail. After arrival he was very welcoming and gave us advice about places to go. The studio was very clean, and candles against mosquitos were there too. The view is amazing! Waking up every day with such a beautiful view is part of the fun. Heaving breakfast on the veranda en paddling on the paddle boards and canoes was great! The water is not deep enough for swimming, but many other beaches are great to do that. Pinel island is very close by canoe, and it's easy to get around the island by car. It was great fun to use the jacuzzi on the beach, that's special. Cooking is possible in the kitchen, supermarkets are in the village. Many restaurants in the area too, with the pizza place very close to the studio. It's peaceful and quiet in the area. We definitely recommend staying here. If we come back to St Martin, we will stay at Studio St Martin again. St Martin over all was very much worth visiting. This was fantastic, I wish we could have stayed longer. We enjoyed our visit to Studio Pinel last year and returned this year to do it again. We were not disappointed and enjoyed it every bit as much. The property is exactly as advertised- clean, quiet and charming. You will need to rent a car if you stay here, to get around to the shops and explore the island. But it is paddling distance to get across to Pinel Island - about 7 min of easy paddling in sea kayaks that Bruno provides for free. There are great beaches and a really nice restaurant on Pinel Island. The owners are very friendly, speak English well and were very helpful when we needed them- but otherwise we didn't see them much and they were not in any way intrusive. Its a wonderful, restful bit of paradise. Très beau séjour dans le studio ilet pinel. Studio très bien aménagé , sur une petite plage permettant d accéder à l ilet pinel avec les kayaks mis à disposition. Jaccuzi très agréable. Bruno et son épouse sont d très bon hôtes, toujours à l écoute et prêt à rendre service. Merci pour ce séjour . Located in the Bay of Cul de Sac, near the nature reserve of Saint-Martin, the place is protected from ocean currents. No waves, shallow, the studios are right on the water, on a small private beach. Located in the Bay of Cul de Sac, near the nature reserve of Saint Martin, this place is protected from sea currents. No waves, shallow, studios feet are in the water, it was small private beach. tarifs basés sur la base de deux personnes . pour la 3et et 4em personne ajouter 10€/jour/personne studio réserve naturelle du 1er septembre au 31 octobre 700€/semaine studio réserve naturelle du 1er novembre au 31 aout 910 euros semaine les arrhes ne sont pas remboursables en cas d'annulation. in case of cancelation the deposit is non refundable.